TouchPOS is committed to protecting the privacy and accuracy of your confidential information to the extent possible, subject to provisions of state and federal law. Other than as required by laws that guarantee public access to certain types of information, or in response to subpoenas or other legal instruments that authorize access, personally-identifiable information is not actively shared. In particular, we do not re-distribute or sell personal information collected on our web servers. TouchPOS may collect personal information such as name, address, e-mail address, telephone number(s), and, when purchases are made, credit card information. Web servers typically collect, at least temporarily, the following information: Internet Protocol (IP) address of computer being used; web pages requested; referring web page; browser used; date and time, and particular IP addresses from which our websites are accessed. 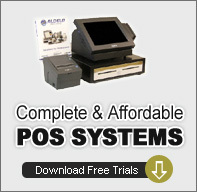 Credit card information is collected in order to process a transaction and is not stored on the TouchPOS servers. Your payment information is transmitted to us using a secure internet method employing the highest currently available encryption method (128 bit), that helps ensure the privacy of this information. TouchPOS may use personal information collected from websites for the purpose of future communication back to online enrollees, in order to keep you informed of special purchase opportunities, new products, or news about TouchPOS, but only if you are provided the opportunity to opt out of that type of use. TouchPOS may use browser-IP-address information and anonymous-browser history to report information about site accesses and for profiling purposes. This information is generally used to improve Web presentation and utilization. TouchPOS will use "cookies" in order to deliver web content specific to individual users’ interests or to keep track of online purchasing transactions. Sensitive personal information is not stored within cookies. TouchPOS uses firewalls to protect outside access to personal information on our computer systems. We take precautions to ensure that your internet account and personal information are accessible only by employees who are authorized to have access to your personal information. TouchPOS will not disclose, without your consent, personal information collected about you, except for certain explicit circumstances in which disclosure is required by law. TouchPOS will not distribute or sell personal information to third-party organizations. Responsibility for sites linked to While using the TouchPOS website, you may encounter hypertext links to the Web pages of organizations not directly affiliated with TouchPOS. TouchPOS does not control the content or information practices of external organizations. We recommend you review the privacy statements of these organizations.